My first ever visit to Ramen Koika was fairly good except for one thing - the ramen burger. It was a good effort, but ultimately, it just didn't work for me. Apparently they agreed too as it is no longer offered on their menu. However, this post is not about the demise of the ramen burger. Rather, it is a re-visit thanks to a menu tasting organized by Jacqueline. 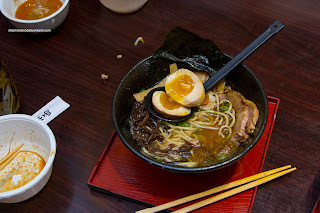 We were treated to several versions of ramen (some I've sampled in my previous visit) as well as various other items. There was just too much food to cover, so I'll mainly focus on ramen for this post. Without further delay, let's get down to the noodles! 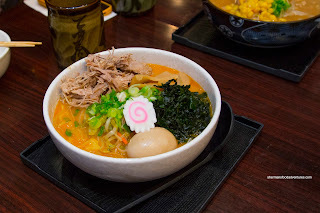 To do a comparison of sorts, I grouped the Sapporo Miso and Kara Miso Ramen together. I found the miso ramen broth to be rich and lightly creamy. 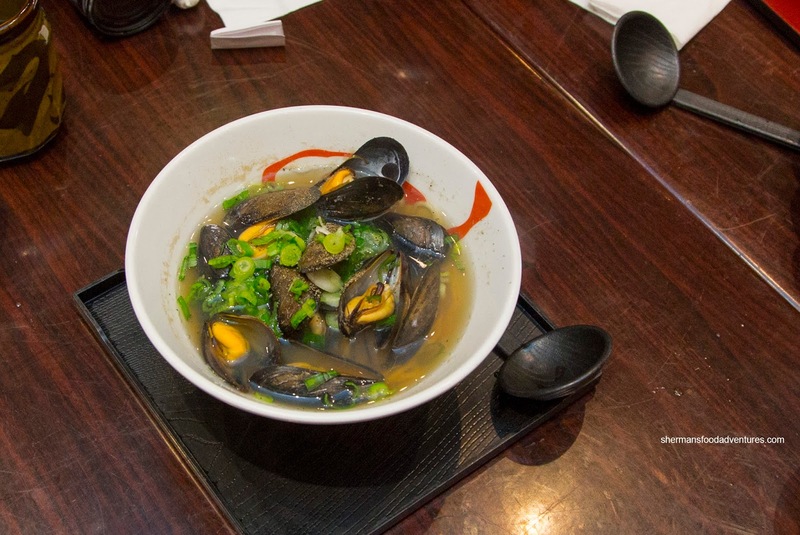 There was a deep balanced saltiness to the broth due to the miso. As much as I'm not a huge fan of ground pork in my ramen, this one worked as it added even more body to an already rich broth. 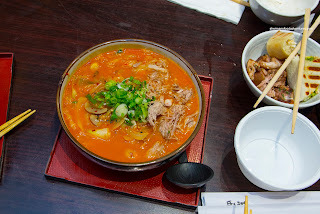 As for the spicy miso, it came as advertised being creamy and thick (but not overly so). There was a slow rumbling spice that stuck around beyond the first taste. There was a certain Earthiness as well from the miso, as well as the aforementioned deep saltiness. 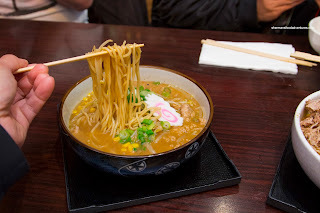 Now the bowls of miso ramen were good, but the Chiba Black Ramen was universally lauded as the best of the bunch. The black garlic oil took the spotlight as it added an aromatic Earthiness to the already rich pork broth. Although it was flavourful, the salt content was just right. The rest of the components were on point too including the ajitama egg and tender chashu. 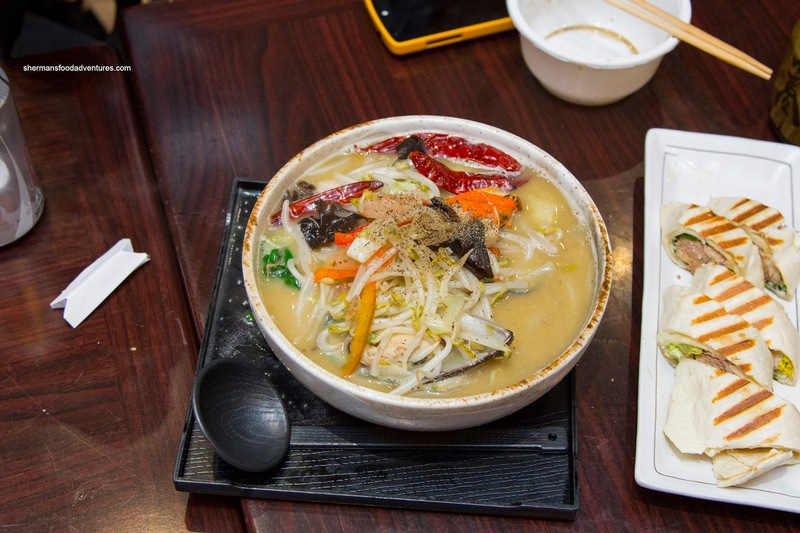 One of their most jam-packed offerings was the King's Ramen consisting of carrot, cabbage, mushroom, green onion, spring onion, bean sprouts, shredded pork, seaweed, bamboo shoots, kamaboko and egg. The shear mass of ingredients helped dilute the chicken broth though. On the other hand, there was variation in textures and flavours. Something completely different, we were served the Okinawa Umi Ramen featuring fresh mussels, garlic, green pepper, red pepper and green onion. The chicken broth was mild, briny and peppery. It was clean and sweet with the taste of the sea. However, I found the use of green and red peppers to be a touch overwhelming for the delicate broth. Another one featuring seafood was the Nagasaki Champon Ramen. This was littered with different ingredients including black tree fungus, bak choy, onion, cabbage, red pepper, green pepper, Thai chili, prawn, scallop, mussel, squid and bean sprouts. Again, for me personally, more didn't necessarily mean better. I found that the pork broth was diluted again due to the mass of items. Our last bowl was the Kimchi Ramen which featured shredded pork, kimchi, mushroom, onion, green onion and cabbage in a chicken broth. Due to the copious amount of kimchi, it was the dominant flavour where the broth was spicy and tangy bordering on sour. The house-made noodles were firm and chewy (we asked for firm) while the pork was melt-in-my-mouth tender. It is worth noting that the rest of the bowls featured the same chewy noodles and they stayed surprisingly so even after our incessant picture taking. Okay, I lied. 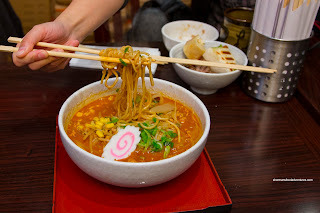 I will talk about some of the other items we had besides the ramen. 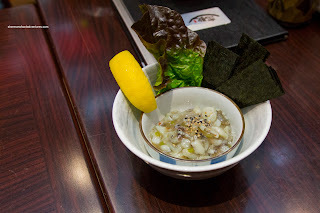 One of our appies was the Tako Wasabi which was served with strips of nori. I found the tako to be rather tender (as tender as it can be) while the pickled veg added a crunchy tang. There was definitely enough wasabi for effect without being overwhelming. I know this is being picky, but the nori strips were too small. 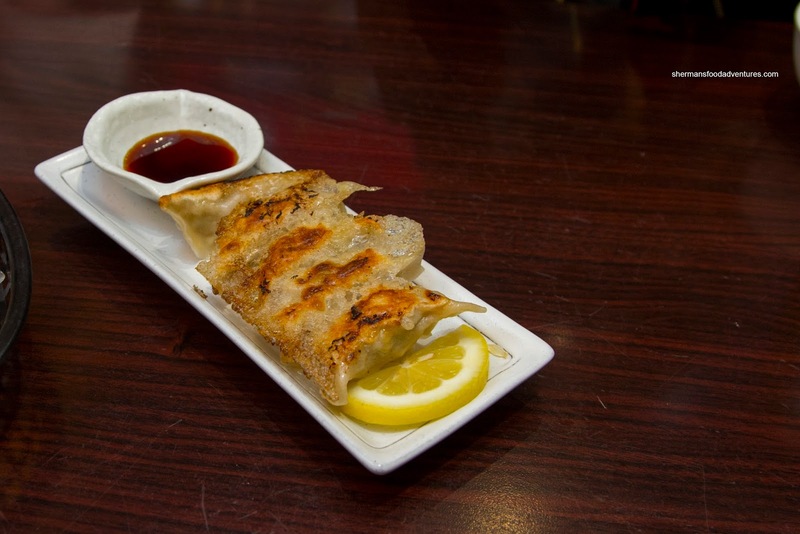 We also got the Pork Gyoza that featured a crispy bottom. The filling was meaty and succulent with only a purposeful amount of cabbage. Beyond the crispy bottom, the rest of the dumpling wrapper was nicely thin and tender. 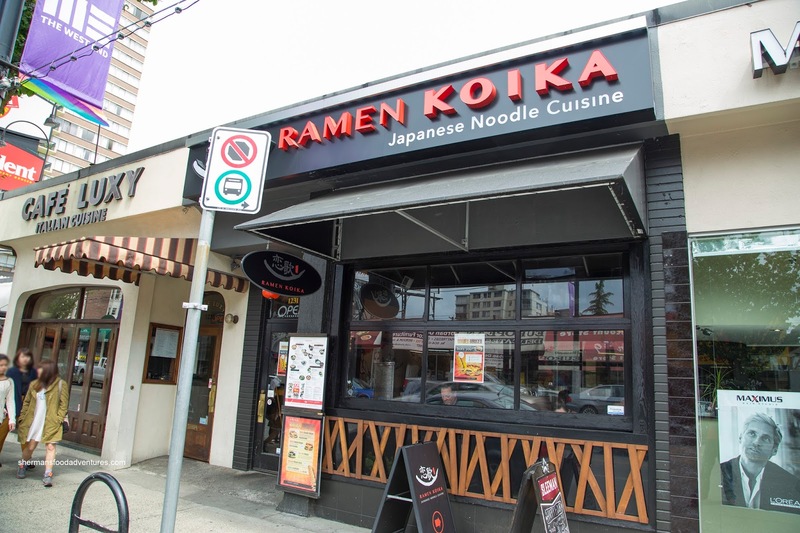 Overall, I thought that the ramen at Ramen Koika were pretty solid featuring flavourful rich broth and being well-portioned. I'd personally stay away from the complicated versions as I found the flavours to be diluted as a result.